The story begins in Spain, whose monarch had clearly established his monumental goals for the conquest of South America. As this effort expanded into Central America, however, the Crown had no choice but to limit its resources for new advances way down south. Carlos V, King of Spain, had just sent an ultimatum to those in charge of the conquest, but the South American conquistadors insisted: they needed more money, troops and support. To make sure his message was fully understood, the King decided to send a final ultimatum to Francisco Pizarro, who was leading the conquest in what is now known as Peru. The trusted messenger was none other than Tomás de Berlanga, the Bishop of Panama, who had no clue he was about to embark on a true adventure. Sea voyages have always carried risks and a good captain knows to load and equip his vessel well. Bishop Tomás de Berlanga’s ship set sail, in theory well-provisioned, from the shores of Panama with a southern course that would have it reaching South America within a week or so. On 23 February 1535, ideal winds took the vessel down through the Pacific Ocean and, for six days, all navigation efforts flowed as planned. Suddenly, strange and strong currents started to take the ship off-course, leaving it stranded in the middle of the ocean. Lost for three days, hungry, puzzled, and thirsty, the crew started to lose hope. They had only enough water left for two more days to complement the few rations in the hold. We can only imagine their joy when on 10 March 1535, the sailors spotted land, lowered one life-boat, and proceeded ashore. For them, it was a question of survival. For humankind, it meant something historical: the discovery of perhaps the last remaining uninhabited islands of the Pacific Ocean. The sailors’ first impressions were anything but positive. 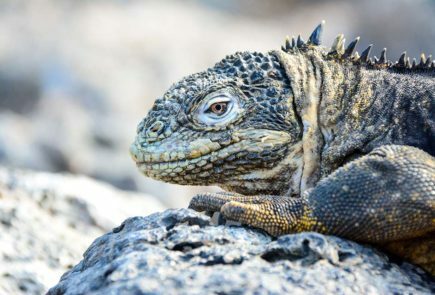 They described the islands as hideous and lacking in hope; seals, tortoises and serpent-like iguanas were described as the only things found ashore. In fact, in a letter written later to the King of Spain, Bishop Berlanga painted a rather bleak picture: “It seems like God had rained stones over the Earth.” They later sailed to another island that they saw out in the distance, with high sierras and plenty of elevation. They hoped to find rivers, rains, and fruits and, instead, found more volcanic terrain and inhospitable conditions. By this point all their water was gone, one man had died, and ten horses had been lost. With no other option available, the parched crew resorted to squeezing out the juice from the few plants found throughout this arid land: cacti. They drank this unappealing green and pale juice almost as if it were rose water. They sent out search groups to find any possible source of the precious liquid. Finally, one had modest success, identifying ravines where water flowed from the highlands. The sailors rejoiced and began to plot a new course for the mainland. Hope emerged in an unlikely form – the cactus. The Bishop, upon determining the ship’s geographical location, realized that there would be no shortcuts to safety. All paths to the South America mainland would require endurance. But they had no other viable option, so they set sail with some good winds, and a decent amount of water. They saw no land for eleven days. By the time they finally sighted land they had no water left and had been forced to drink only wine. They entered the Bay of Caraques on 9 April 1535 and headed inland. Don Francisco Pizarro, the great conquistador, was yet to be located and the Crown message still had to be delivered. Nobody knows which islands Tomas de Berlanga and his crew actually visited. But history recognizes them as the first humans to set foot in the archipelago. Spain never moved to establish any settlement on the Galapagos Islands due to the inhospitable conditions that had been reported. The islands were uninhabited and would remain so for centuries. Plaque from the home of Fray Tomás de Berlanga, IV Bishop of Panama and official discoverer of the Galapagos Islands. The Spanish sailors baptized the archipelago as “Islas de los Galapagos” because the tortoises that they found in great quantity resembled an old-style riding saddle known in their mother country as a “galapago.” The Galapagos tortoises saved the lives of passing sailors for hundreds of years, as they could survive for almost a year in the hold of ships and provided a fresh meat source, but this consumption almost led to their extinction. Thankfully, current breeding programs – such as the one at the Charles Darwin Research Station that we visit on all of our itineraries – keep that part of history very much alive today. A galapago is actually a saddle, not a tortoise. Spanish sailors identified the shape of the local tortoises with the saddle and the name stuck, for both the animals and the islands.